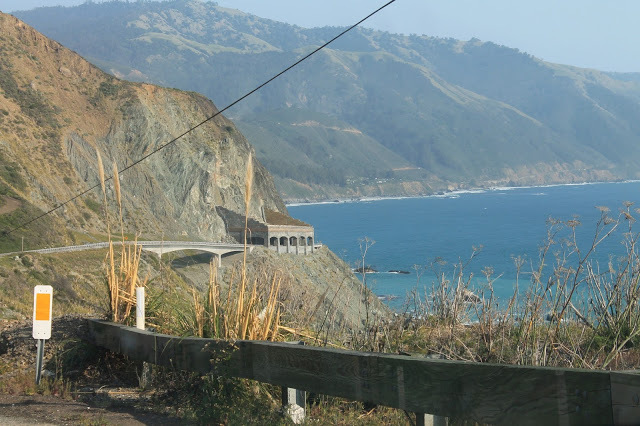 Something I’ve always been fascinated with is the Pacific Coast Highway, the PCH, Route 1, or the beautiful road that goes right next to ocean that everyone is alwaclys driving on in convertibles. Whatever you call it. It’s something I’ve always wanted to drive down, and I have TV and movies to thank for that. Just thinking of Kate Walsh driving down in her convertible when she was moving from Grey’s Anatomy to the Private Practice pilot, it looked so cool. 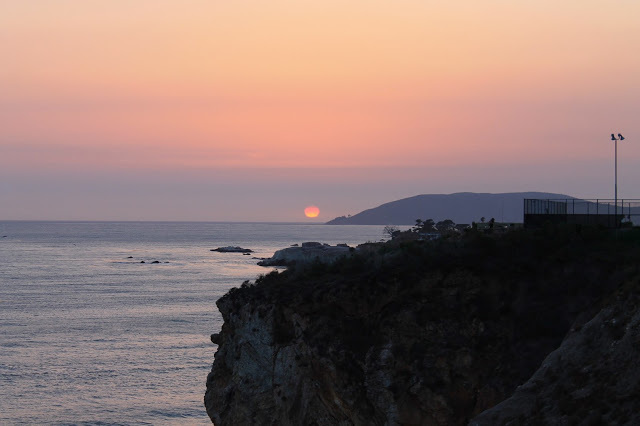 When I moved to California, one of my favorite things to do was drive up a short stretch of the PCH, typically up to just past Malibu, stop at one of the tiny generally uninhabited state beaches, and watch the sunset. I used to do that on my own when I wanted some time to myself to think, I drove up on both my 24th and 25th birthdays, I drove my brother when he came to visit, and honestly I drove up whenever I felt like it. 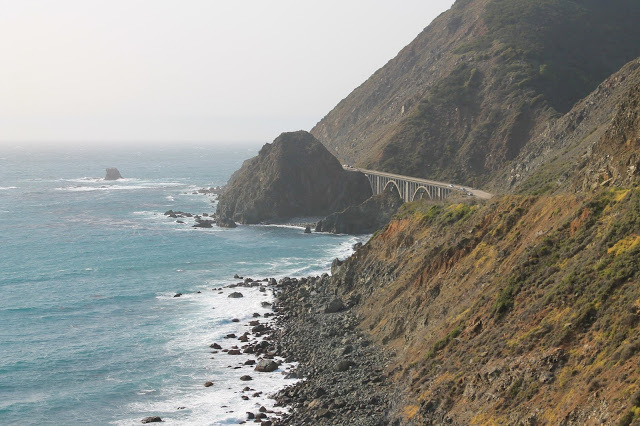 So, last year, when I was making my 30 before 30 list, I knew I wanted to drive down the PCH and actually drive along a long stretch of the road that goes right next to the ocean. Like, cliff-highway-plunging drop to the ocean. Well, like most well intentioned and thought out things, time was running out during my last couple of months in LA. Most weekends had trips or activities planned, and I knew I was going to have to just go and commit to this. 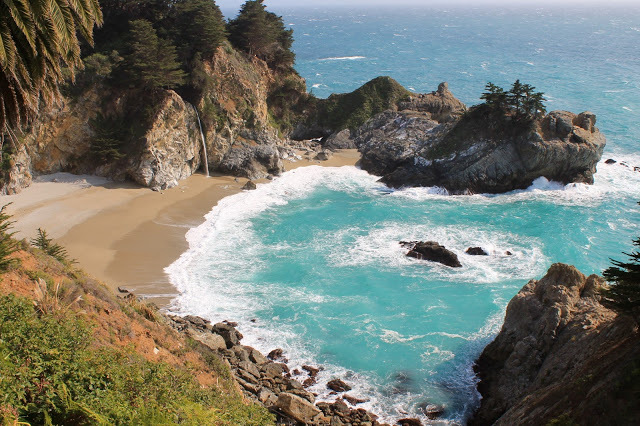 I talked to my best friend Chris about it, and I realized that while someday I could go back and do a multiple day drive down the coast, from San Francisco down to LA, right now I could do a crazy day trip and drive up/down the coast. Plus, he said he would come along for the ride with me, so not having to spend 11 hours in the car by myself was definitely nice. I did some minor research to figure out how far up I wanted to drive. 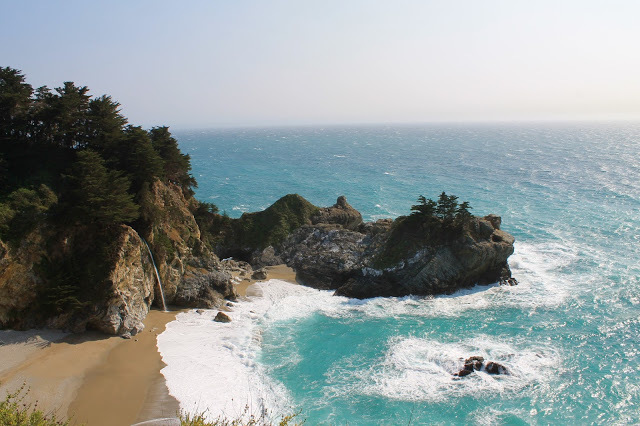 I wish I could remember how, but somehow I came across the 80 foot waterfall in the Julia Pfeiffer Burns State Park that was about 5 hours outside of Los Angeles. I was sold. 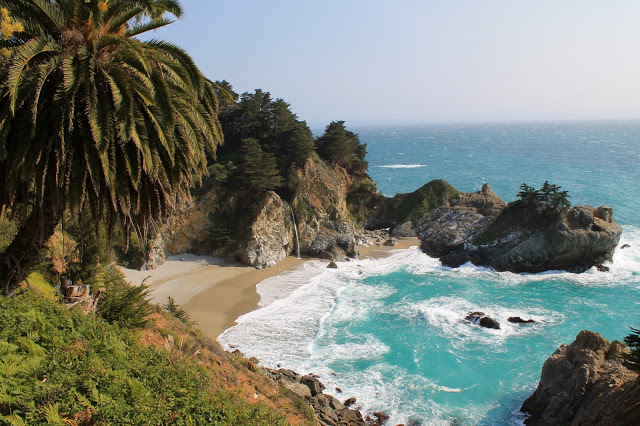 As for our actual drive, I knew the general route I wanted to take (the 101 past Santa Barbara, since I had already done that portion of the PCH, and then up the PCH until we hit the waterfall) and some general stops we could make, but that was it. Chris and I left LA around 9 or 9:30am and started driving. 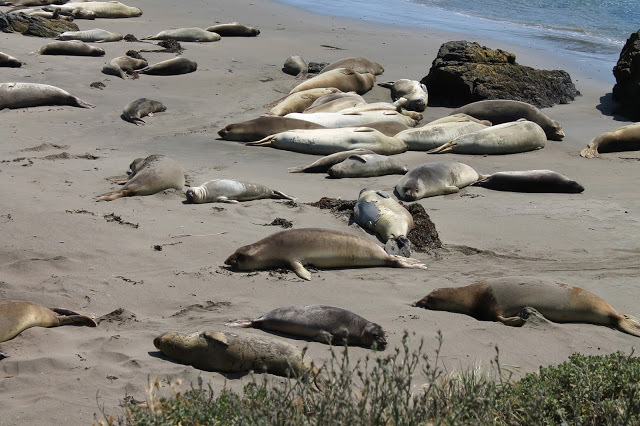 We stopped for snacks, we snapped lots of pictures from the car, and then we made our first real stop – Elephant Seal Beach. To say it was windy would have been an understatement. I was wearing a sundress and was SO happy I thought to pack exercise pants in the car because my dress was blowing like craaaazy. Some serious almost Marilyn Monroe moments. 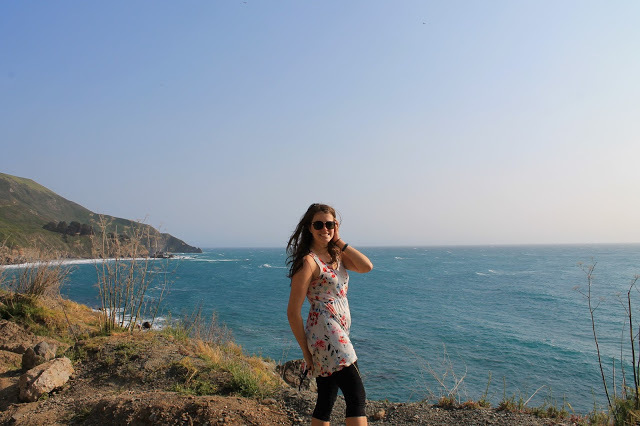 Now this beach, it was beautiful and crazy to see. 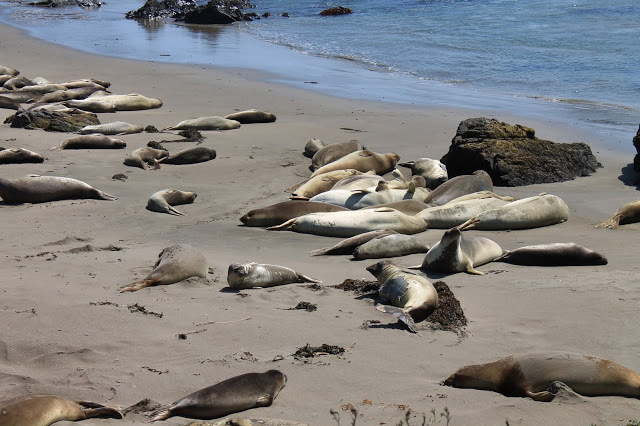 There were hundreds of elephant seals just chilling. Like, straight up chilling. Lying on the beach and barely moving. 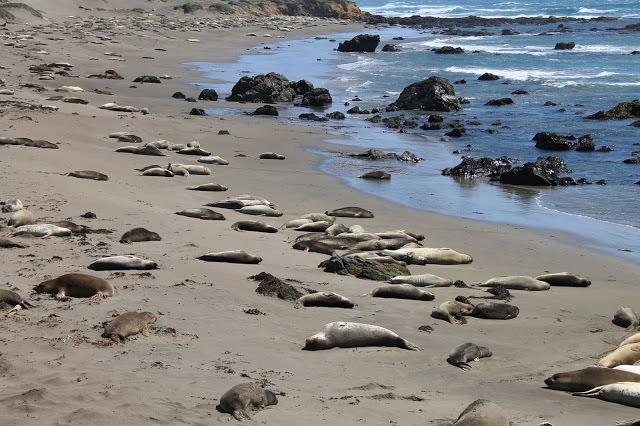 Occasionally you’d see a couple of seals use their fins to throw some sand onto their bodies to help them keep cool, and occasionally you’d see a couple of seals go on a journey. Now, I call it a journey because it was hysterical watching them move 10 feet. You could see their faces and then they’d wiggle forward a couple of feet and stop, take a rest for a minute or two, wiggle another couple of feet, rest, and wiggle some more. They were HUGE. Which I know is why they can’t move very quickly or efficiently on land. You can see a small and large seal below move and then take their break. They moved about 2-3 feet. 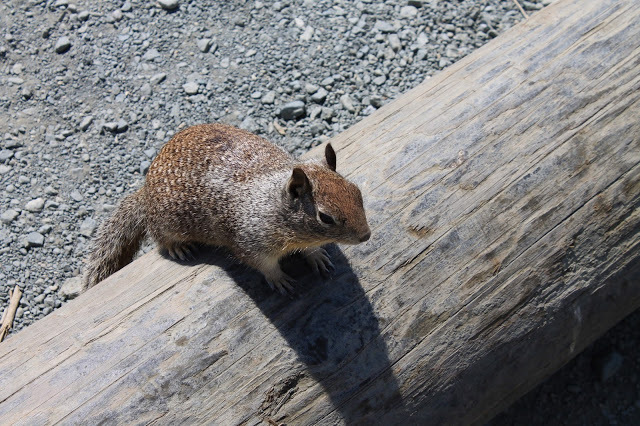 We also saw these really weird squirrels that had super pointy ears and I thought they were devil squirrels. 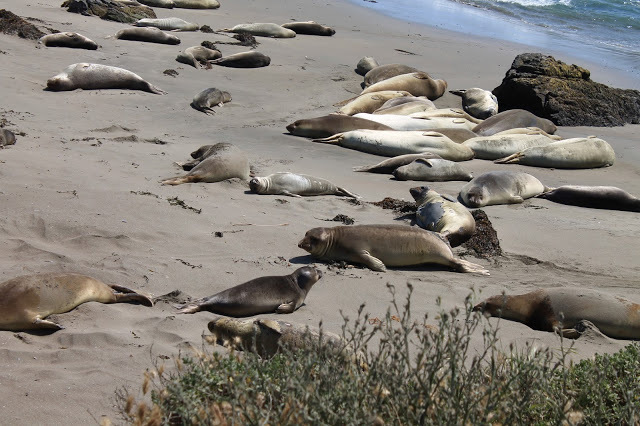 Anyway, once we left Elephant Seal Beach, we continued up the PCH. We drove past some beautiful vineyards, we drove past Hearst Castle, which is on my list for next time, since all the tours were sold out that day. We stopped in Morro Bay at a little pizza place, called Pizza Port, where we shared and demolished a pizza. 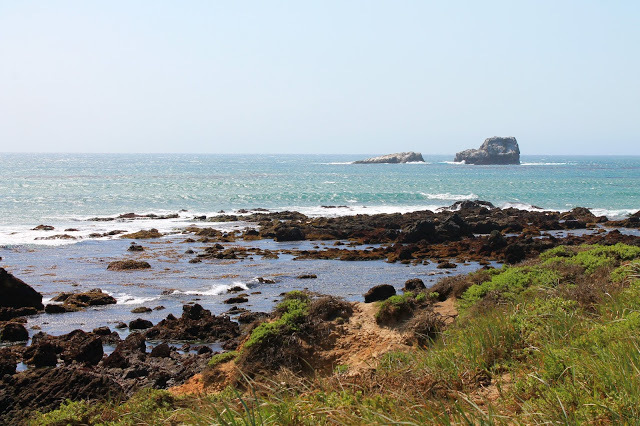 Once we left Morro Bay, our cell service pretty much disappeared which was nice. No phones, no distractions, just good friends and the beautiful open road. 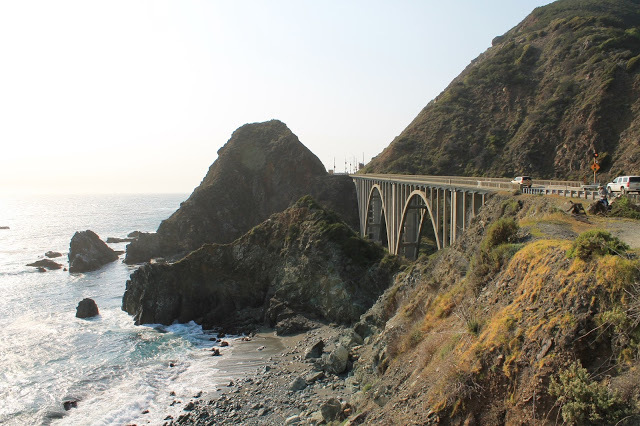 We saw beautiful bridges and tunnels as we made our way further up the coast. 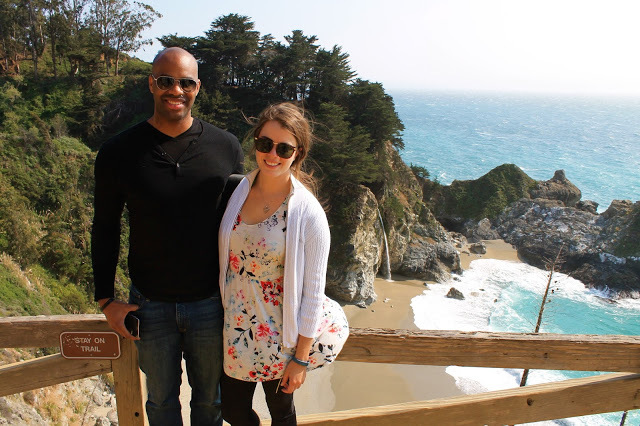 We eventually made it up to Julia Pfeiffer Burns State Park and I was speechless. 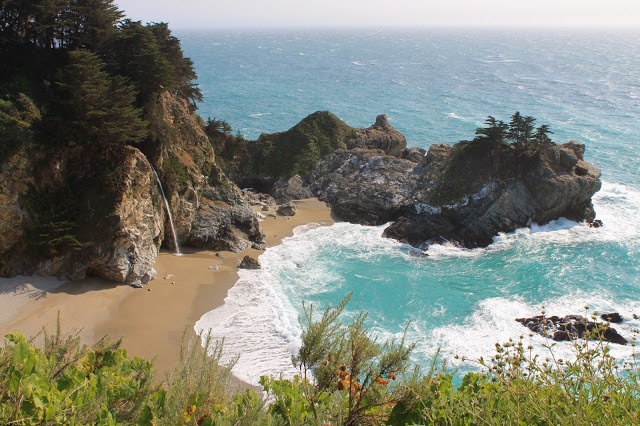 You park in the park lot or anywhere along the PCH and then you follow the little walking path down to the overlook of McWay Falls. I was a little bummed that you’re not actually allowed to go down on the beach, but ultimately I was happy that you couldn’t. It was so beautiful, so serene, and just incredible. It’s also a highly sensitive area and the beach area is unsafe and kind of unstable, so it’s for good reason that you can’t go down there. There were little placards that told you about the beach. The 80 foot waterfall used to fall directly into the ocean, making it one of the only ones in the world. Wikipedia has a list and there are just about 20 waterfalls that do this. 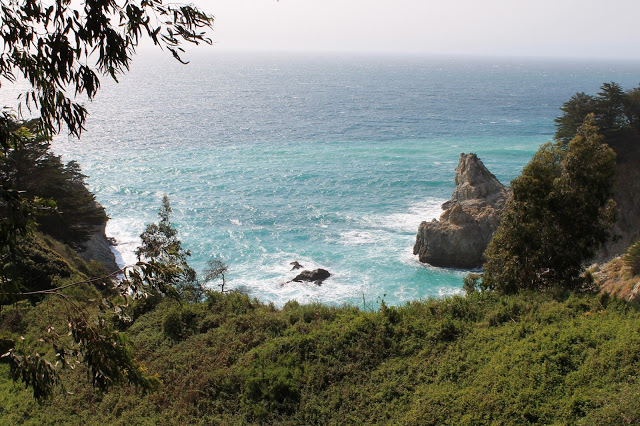 However, in 1985 there was a landslide a couple hundred yards up the coast (you could still see where the terrain was way different) that deposited tons of debris and sand. Which, in turn, created the beach. A little further down the walkway, you could see that foundation of a house that had been built sometime in the early 1900s and was demolished in the 60s. It was incredible. This view was worth every second spent in the car, and the crazy thing, this is exactly how it looked in real life. I posted a picture on instagram that had no filter, nothing. It was that beautiful in person. I have about 20+ more pictures on my computer, but I figured that sharing more than 4 of pretty much the same view would have been considered excessive.. While I would have LOVED to have watched the sunset from here, we still had about 5 hours left in the car to now drive back to Los Angeles. Even though we drove back the same way, it was still incredibly beautiful. We also had really good timing because we hit the sunset right at the last stretch of road that went along the water; after that the road continued inland for awhile. It was gorgeous, but it was one of those sunsets that cameras can’t do justice. No road trip would be complete without some In n Out, so we of course stopped there before. I have to say, I miss In n Out here on the east coast. But now I have bagels and pizza again, so I’m happy there. Anyway, long story short, this is the first item I was able to cross off my 30 before 30 list, and boy was it a great way to kick it off.